Bambi’s Cool Comfort Mattress Protector assists you in sleeping better in a number of ways, with focus on maintaining your body temperature and breathability as you sleep. And thanks to its Cool Pass high-tech fabric (the same material used to keep astronauts comfortable in outer space! ), you’ll not only be comfy, but you’ll be adding soft and breathable comfort to your bed. 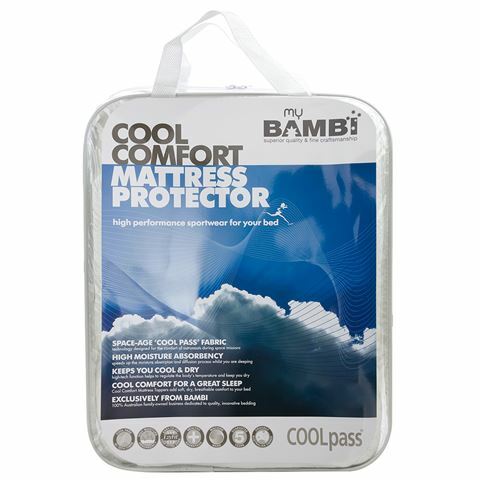 Thanks to its high moisture absorbency, the Cool Comfort Mattress Protector will keep you cool and dry, and it’s also elasticated for a sound fit. The inner fibres are safe for those with allergies, and the entire thing can be popped in the washing machine in cleaning day.